In our Sommersemester 2015 at FH Münster, I got the change to do an interimistic professorship (Vertretungsprofessur) for audiovisual media design. Next to the type ’n’motion module, which was also talking place (please find the documentation here), I wanted to add something more experimental to the curriculum. So, together with my fantastic collegue Vertr.Prof. Gregor Kuschmirz, with who I shared this teaching unit, we used the great chance to concept a very special audiovisual class module: We called it "Visual Music: Rhythmic Data Scapes". The trinity of motion picture synced or created to/with rhythm, embedding meaningful data by creating a special context and resulting or working with aesthetically visualized scapes was the aim to reach in 4months. 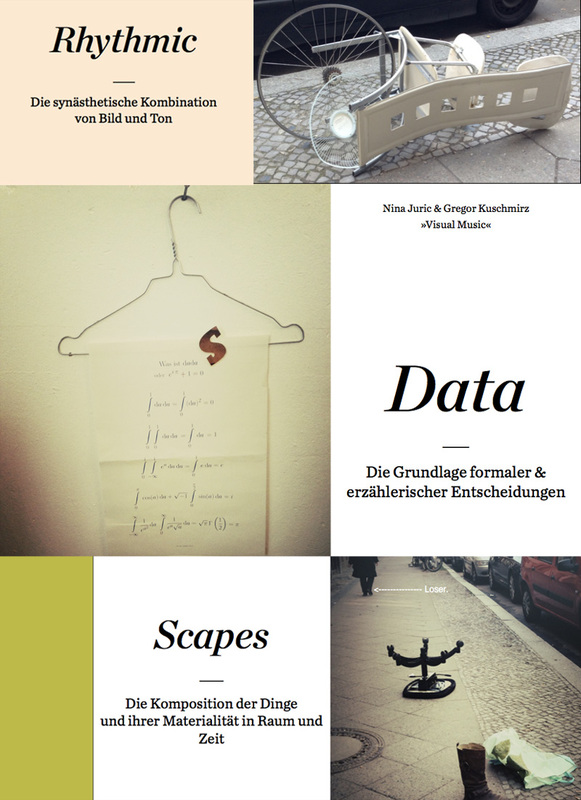 Our inputs were focused on installation art, especially conceptual film who worked with datasets, but also alalysis of infografics and what about data-questions. Next to the theory, it was all about how to operate and proceed a conceptual motion picture project from the very idea to the final audiovisual product, via concept, visualization, about the role of the audience, the context, the viewer in generell and how to come up with strong concepts, topics and data-sets. As a limitation, we brought partitures of famous soundpieces, which should be used as the base dataset for a strong conceptual work. From there it could go anywhere, and it did. We are very happy that this class worked out that way within our teaching ping - pong. We had some great students, who did really not have an easy time, with this quite complex themes, we had to bring them in. With a pre-defined context of "Doofe Musik" inspired by a curated show of HKW (Haus der Kulturen der Welt) in Berlin, we tried to include aswell some innovative, contemporary teaching concepts. Now, we can tell about inspiring methods and approaches how to deal with this topic combining it with some colaborative didactic aspects by i.e. rotation concepts within the steps to be taken at that point. The group dynamic in this class was very vibrant, even during harder times within each project. Please find the results of Nina Drüke, Bahar Zeraatkar, Tobias Pöpping, Marina Bykova, Partick Müller (is stil working on it) and Lisa Schlosser below and scoll, as they became so different and varied, that it is worth to see them. They all have been screened at 1st AV SLAM at Fh Muenster.